Purpose: The purpose of this review is to examine the available evidence on defining professionalism and dietetic practice in Sudan. Design/Methods: A comprehensive search of six electronic databases including ISI, Medline, PubMed, EMBASE, Health Management Information Consortium (HMIC) and PsycINFO was conducted in March 2015 to find evidence related to professionalism and standards of dietetic practices in Sudan. Findings: There is a lack of significant prior research on professionalism and practice specific to the field of nutrition and dietetics in Sudan. 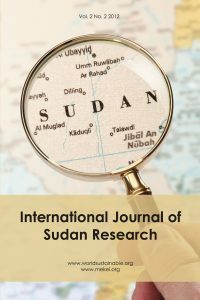 Social Implications: Based on the results of the review, we urgently call for dietetic professionals to assemble a group of leaders and thinkers, particularly dietetic educators and researchers, to help in the development of professionalism of the field of dietetics and to unify the dietetic practice in Sudan. Originality and Value: By adopting the methodology of reviewing published papers, we can identify gaps in professionalism in the field of dietetics. We can also identify sustainable dietetic practices in Sudan, which could stimulate new research agendas in this area. Elham Aljaaly is Saudi national. She is an Assistant Professor and the Head of the Clinical Nutrition Department at Medical Applied College, King Abdulaziz University in Jeddah, Saudi Arabia.